Sage today made official that they’ll be rolling out a common payroll based on their SData communication protocol. This common payroll fills a hole in the Sage MAS 200 SQL release (due November 2010) where legacy (non 4.x standard modules which include payroll) cannot be used with the MAS 200 SQL release. By creating a common payroll solution Sage hopes to cut down development costs that are soaring as the government continues to change employer tax laws. Each change in tax law requires Sage to update payroll (usually at the very end of the year when everyone is busiest), test the changes, and quickly distribute those upgrades to end users. 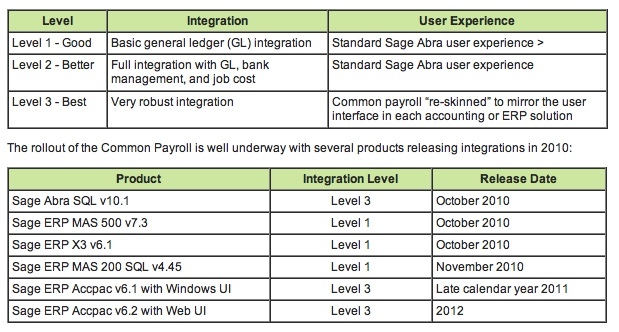 Under the Sage Common Payroll initiative the ACCPAC SQL Payroll will be used by at least four Sage products (ABRA SQL v10.1, MAS500 v7.3, ERP X3 v6.1, MAS200 SQL 4.45). Integration levels will vary depending upon product with only Accpac and ABRA receiving level 3 or very robust integration. Common Payroll is the Sage ERP Accpac payroll module which has been enhanced to become a best-of-breed SQL Server-based payroll that can serve the needs of many of our Sage North America customers. With over 4000 payroll customers in the US and Canada, the Sage ERP Accpac payroll module has a strong track record of providing value to small and medium sized businesses. Using Sage ERP Accpac payroll as the foundation and the new common sData communication protocol to facilitate connectivity, the new Common Payroll module will offer the tightest level of integration possible between payroll and all of our ERP solutions. How will a Common Payroll support Sage’s strategy to maximize our assets and reduce redundancies? One example lies in the hundreds of new tax changes that are mandated each year. In 2009 there were more than 200 changes released and that number is expected to increase in 2010. To keep on top of these changes, Sage spends a great deal of money each year to maintain our 12 unique payroll modules, and in some cases, multiple versions for each product. Imagine how much we could accomplish by removing this redundancy of effort, provide the updates in a form that could be used by all our products, and instead leverage our resources to provide customers with greater value, such as new connected services. And because the payroll-related connected services such employee benefit services would only need to be developed once, it would mean they could be made available immediately to all our customers with little to no incremental effort required by individual product teams. The Common Payroll initiative also supports our goal for providing an Extraordinary Customer Experience as we focus our efforts on developing a single best-of-breed solution that surpasses the functionality and ease of use found in our current payroll modules. This new, unified payroll module will not only scale as a business grows, but if a customer needs to upgrade to another Sage ERP (enterprise resource planning) product, the payroll data will seamlessly migrate. Common Payroll integration will soon be on the roadmaps for many of our other products, so stay tuned for details. 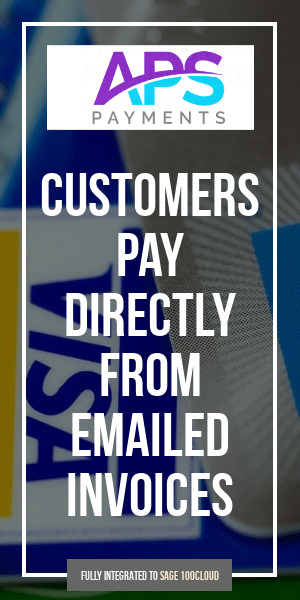 You can rest assured that the native payroll module will continue to be enhanced, sold and supported for those products where it doesn’t make sense to adopt a common payroll. The Common Payroll integration is an important step toward achieving our objectives and providing your clients with greater value. Projects like Common Payroll not only generate substantial savings and leverage best practices, but enable us to deliver a common experience to our mutual clients.